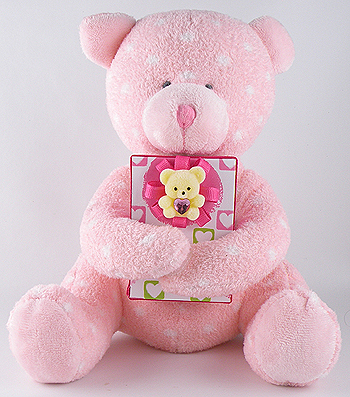 This adorable bear is the perfect way to give a gift for Valentine’s Day. I used a bear with long arms and I attached peel-and-stick Velcro to the paws so they would lock together to hold the gift. I decorating a lid of a cardboard jewelry box with a piece of scrapbooking paper, a pretty bow and a tiny bear to make it even more lovable. To recreate this idea, find a cute stuffed animal with arms long enough to hold the gift and peel-and-stick Velcro can be found at most craft and fabric stores. This entry was posted in Crafts, Everything, Gift Wrapping and tagged gift wrap, Gina Tepper, jewelry box, pink bear, rhinesones, scrapbooking paper, teddy bear, tiny bear, valentine's day. Bookmark the permalink.